Because my disease is genetic, there is (obviously) no cure. Unfortunately, it also means I will take lots of medicine for the rest of my life. And that managing pain will be something I do forever. One of the things I learned early on is pain medication is both your friend and your enemy. While it is an important part of me remaining mobile and functional, the wrong medication at the wrong dose can make me feel like sleeping all day. Or even worse, the side effects make me feel just awful. Let me be SUPER CLEAR – essential oils are not going to cure your arthritis. BUT I do use essential oils to manage pain (especially in my hands!) so that I stay as mobile as possible and can go on with my life. My favorite products from Young Living are the Cool Azul Cream, the Deep Relief Roll-on, and the PanAway essential oil. I use them all based on how they perform on my body. Cool Azul sits on my nightstand and my desk because it helps loosen stiffness for me. The Deep Relief Roll-on helps me the most with deep joint pain and I keep it in my purse at all times! I also keep it in my knitting bag with little finger splints that help my joints stay stable when I am working on crafts. And PanAway mixes with a carrier oil when I talk my husband into a back or neck rub. Since arthritis causes joint pain and stiffness, you may find that trying different essential oils can help you. Results will vary from person to person but I am living proof that oils have the potential to bring relief from arthritis pain? It is not perfect – and it never gets rid of all of my pain but it does help me manage the amount of pain medication I have to take. Peppermint has menthol, as you probably already know. It also has anti-inflammatory properties that help reduce the swelling in your joints, easing pressure and pain. It can also help relieve pain. Lavender seems good at helping with nearly everything. It has a calming effect, which is always good for pain management. However, it also promotes good circulation and keeps the flow of oxygen moving as it should to help free your joints and muscles of pain. Eucalyptus is a great natural pain reliever. It opens up the blood vessels in the body and improves circulation. It helps by allowing the body to heal naturally. It can also help with joint pain. Rosemary has an anti-inflammatory as well as antispasmodic and analgesic properties. This means it helps reduce inflammation but it also improves circulation and eases pain. That covers all the basics of arthritis relief. 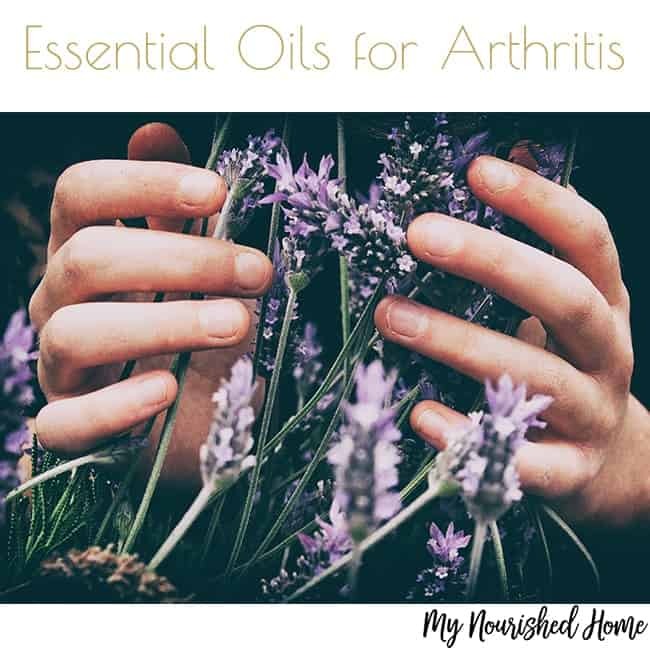 Now that you know you can use essential oils for arthritis, you’re ready to try them for yourself. Remember, that not every oil will work the same for every person. You may want to experiment with a few different oils and blends until you find one that suits your needs how you want. You should also remember that your arthritis pain will change over time so you may need to change what’s working for something new in the future. If you have questions about Ehlers Danlos, essential oils, or how I use oils as part of my pain management plan, I would love to answer any of your questions. Email me at cynthia@mynourishedhome.com or message me on Facebook. Great advice thank you. I didn’t know the info about the peppermint oil so that was well received! I make lavender and rosemary oil to rub into my partners hands when his arthritis is particularly bad. And you are right lavender is excellent for so many things. I get stress cold sores and dabbing a little on every few hours drys them up in only a couple of days. Good information here, Cynthia and sorry to hear about your condition. It’s good to be able to use this oils in certain illnesses rather than using medications with side effects. This will be very helpful to a lot of people. Thank you for sharing! Can I use cacao powder in chocolate muffins? 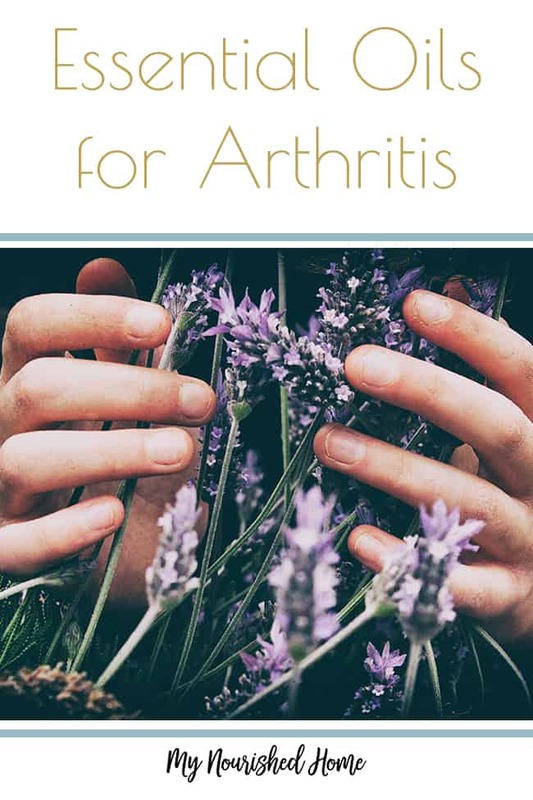 These are very helpful informations, I don’t suffer with arthritis myself, but there are a couple of relatives of mine who’d make a good use of the essential oils. Thank you for sharing!